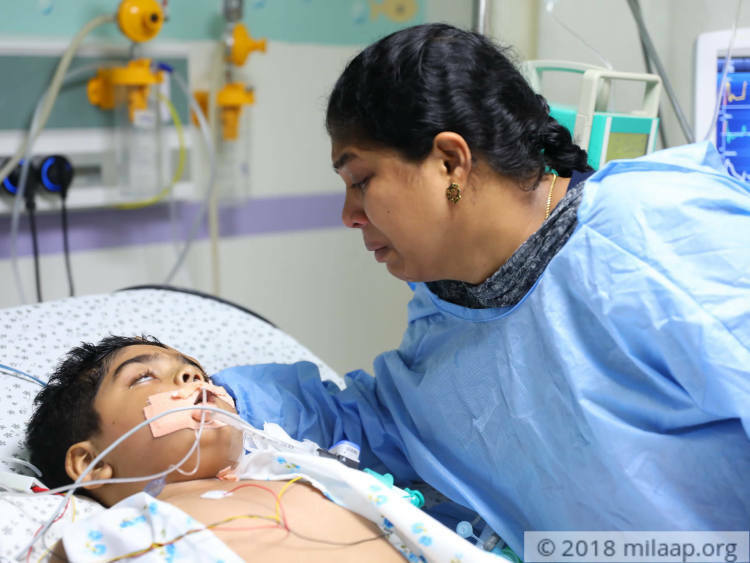 "10 days ago, on a normal day at school, my son suddenly vomited and fell out of his chair and collapsed on the ground. 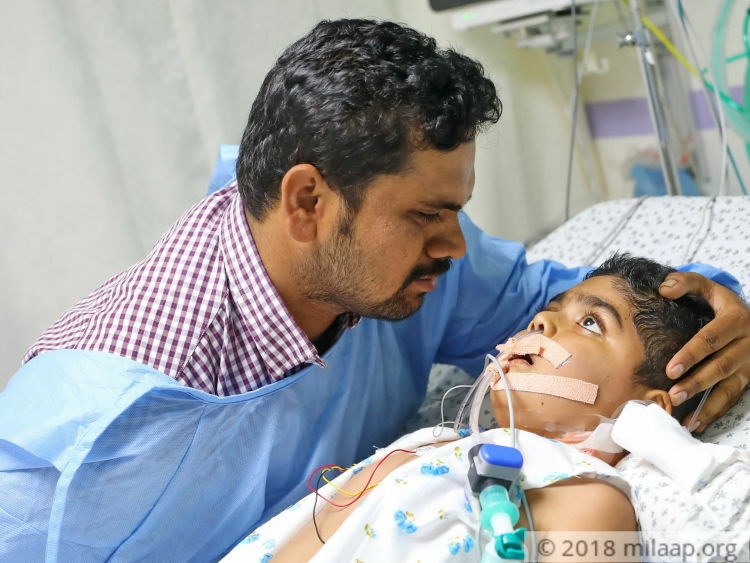 When we were rushing him to the hospital, all along the way he was fighting to breathe and was complaining that he could not see anything properly. We were terrified. He was immediately admitted to intensive care and we were told that the steroids that were helping him fight kidney infection, are now killing him. It has caused cataract in his eyes and cannot breathe without ventilator support. He needs PICU care to survive. My husband barely earns Rs 300 a day, and despite borrowing over 22 lakhs, we are unable to save him," - Suvarna, Nikhil's mother. 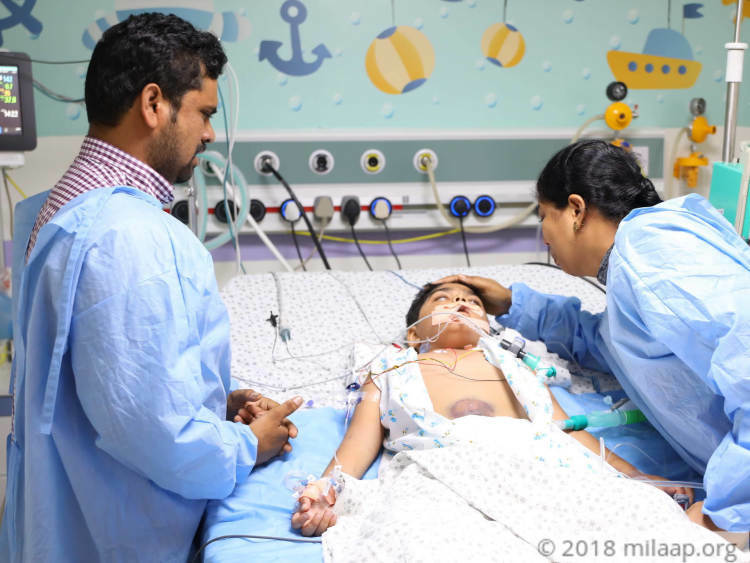 When little Nikhil was 4-year-old, his stomach and legs were swollen abnormally. After urine and blood tests, he was diagnosed with nephrotic syndrome, a kidney disorder that causes the body to excrete too much protein in the urine. Ever since then he has been on steroids every day, to control protein levels. Sadly, now the use of steroids led to severe pneumonia and Acute Respiratory Distress Syndrome (ARDS), a condition in which infectious fluid collects in both the lungs, depriving organs of oxygen. It has only caused cataract which is clouding his vision. He urgently needs ventilation support and PICU (pediatric intensive care unit) stay for 8 days without which he will not survive. The poor parents have struggled to start the treatment but they cannot continue it. "It has been 9 days that my son hasn't uttered a word. He cannot breathe without the machine's support. I wait outside the PICU unit and tremble with fear, thinking how we will be able to continue his treatment. Life has never been easy on him. Over two years, there isn't a day that passed where my son would not feel inferior to his younger sister. His physical growth has slowed down so much that his sister who is 2 years younger to him has grown taller than him. He is well aware of his condition and he often cries saying 'Will I ever be able to live a normal life? when will all this end? '," - Suvarna. 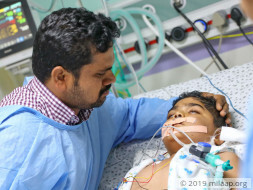 A month ago, little Nikhil and his father Dinesh met with an accident. 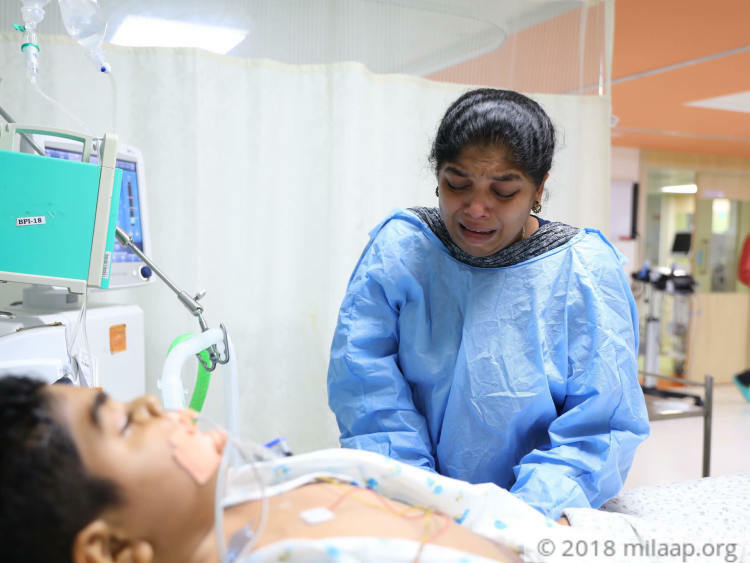 Unfortunately, Nikhil fell on the ground from the two-wheeler on his stomach, which was bloated with excess water as he had trouble passing the urine. This led to internal bleeding in his stomach. He was treated for a month to control the bleeding and this left a big mark on his stomach. "My son was always interested to go out with his father. 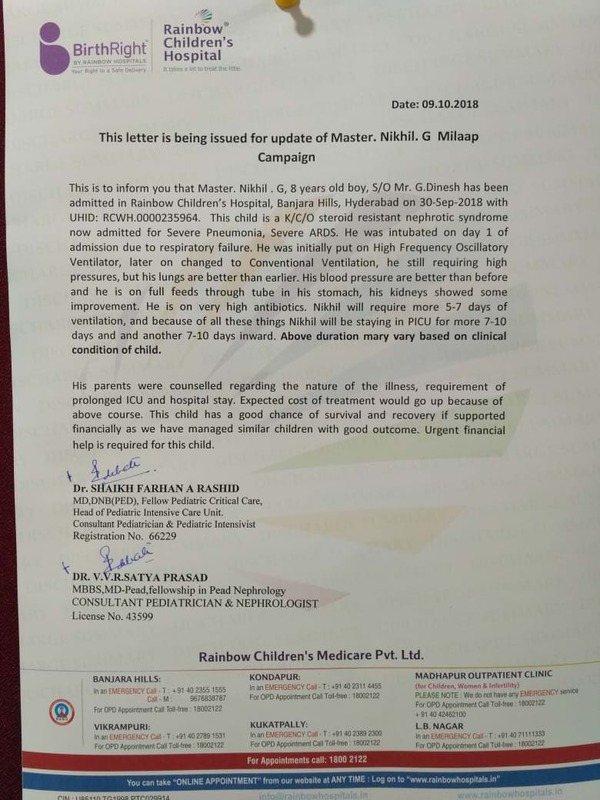 We hardly allow him to go anywhere outdoors, except school, as he is very prone to infections. But on that fateful day, he begged and asked me to allow him to go to the market with his father. I never knew that it would turn out to be so tragic. The accident had almost killed our son. 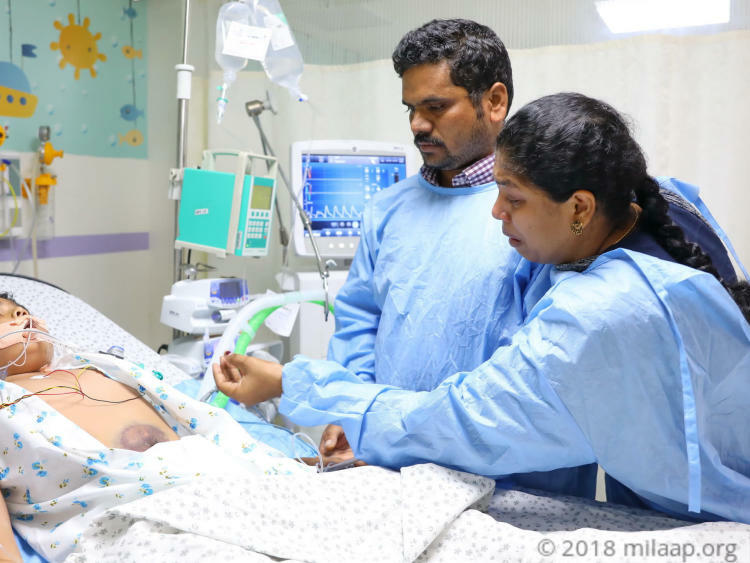 He cannot do it without the support of the PICU care and there is any time left to afford the treatment," - Suvarna. Dinesh is the sole bread-earner of the family. He works as a television technician for Rs 300 a day. With this little income, he was struggling to feed his family. Now he is unable to bear the expenses of the treatment which costs 8 lakhs. "We have been borrowing a huge sum of money from the day he was diagnosed with the kidney infection. Once we bought enough steroids for a week, we would immediately start asking money to buy them for the next week. Without steroids, he would have become critical - so we made sure we begged ahead of time. We have spent around 22 lakhs until now. We have exhausted all our savings and are left empty-handed," - Suvarna. 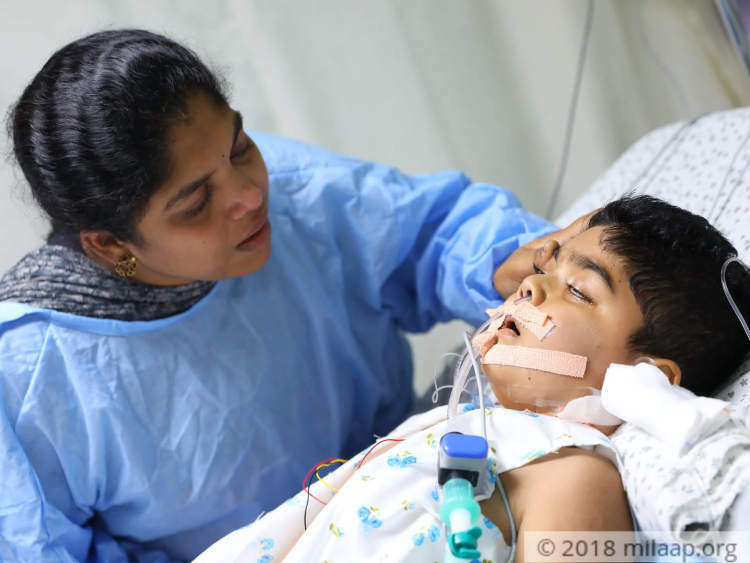 8-year-old Nikhil who wants to live a normal life like his sister is battling for life every second. From the age of 4, he has been suffering from a kidney infection and has been taking steroids ever since. But now the medicines that were helping him heal have put his life at risk now. It has filled his lungs with fluid that doesn't allow him to breathe and also caused pneumonia which makes his condition more vulnerable. 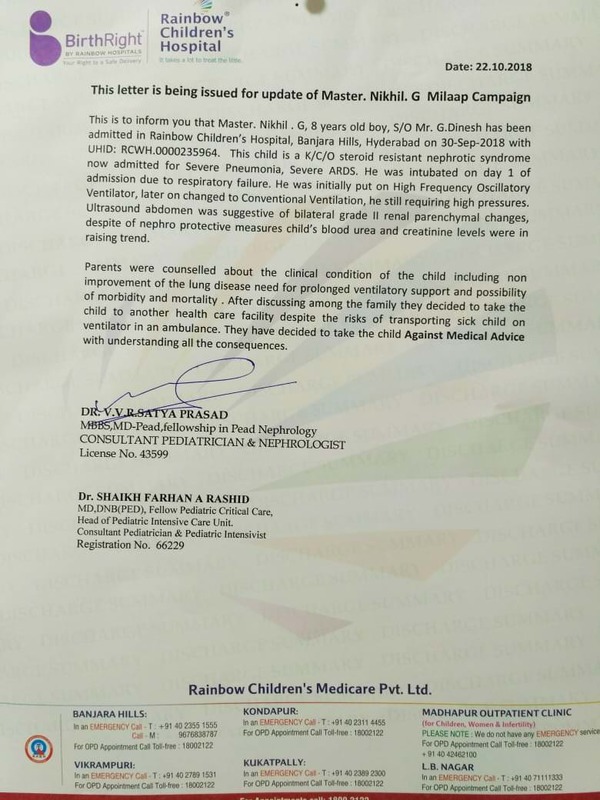 Without urgent PICU care, the child will not survive. The poor parents cannot afford the only treatment that can save his life. We regret to inform you that Nikhil is no more. He passed away at home. 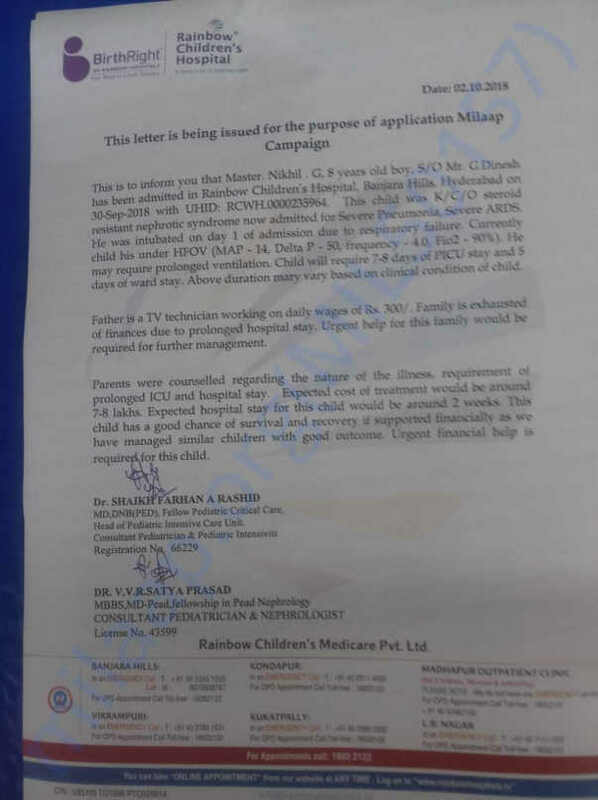 All the funds raised through this campaign will be utilized for his treatment expenses. Please pray for his family in these tough times. May his soul rest in peace. 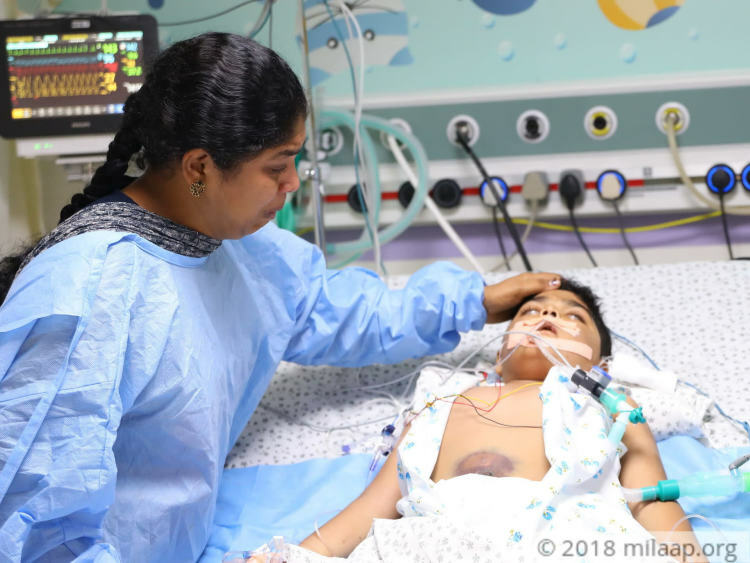 I would like to inform you that Nikhil is presently on ventilation and is being treated with high antiboitics due to which he will stay in the PICU for another 7-10 days. His blood pressure is better than before and and he is being fed through tubes connected to the stomach. Also, his kidney has shown improvement. Please continue to pray for his health and share the campaign. Will keep you posted.